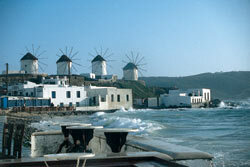 Mykonos has daily ferry connections with Piraeus, Rafina, Tinos, Syros, Paros, Naxos, Ios, Santorini and Andros. It is also frequently connected with Crete (Heraklion), Amorgos, Astypalaia, Kos, Rhodes and Samos. Less frequently is also connected with Ikaria, Serifos, Sifnos, Thessaloniki, Kalymnos, Nissyros, Tilos. Catamarans connect Mykonos to Piraeus, Tinos, Syros, Ios. Excursion boats to Delos daily. There are daily flight connections with Athens - West Terminal, 50 minutes - and several with Rhodes, Santorini and Crete (Heraklion).